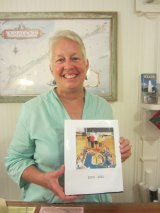 Blanche Howard Jolliff is one of Ocracoke Island’s true treasures. Today marks the 80th birthday of Geneva May Midgette Odom. Mary Ellen Piland plans to enjoy retirement. This article first appeared in the weekly paper The Ocracoker in June 2010. Deana and Caroline were 12 and 11 at the time they wrote it.